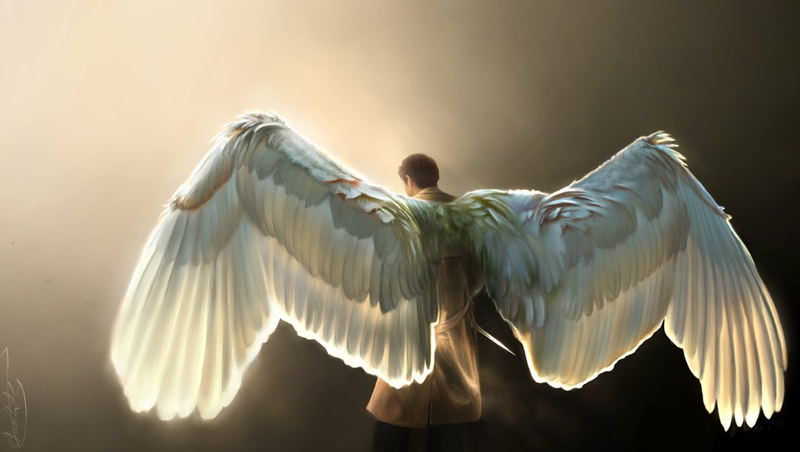 EPBOT: July Art Roundup: Supernatural, Sherlock, Star Trek, & More! Happy Friday to you too! Great finds this month! Oh, the Disney pieces are just beautiful! And I really like the background in the Leia one as well. I like the cartoon-y style art, but I especially appreciate a slightly darker, more watercolor aesthetic. My 4 year old would love the Hello Kitty Wonder Woman! Great selection of art. I saw the Leia print the other day on your pinterest board. Love it! 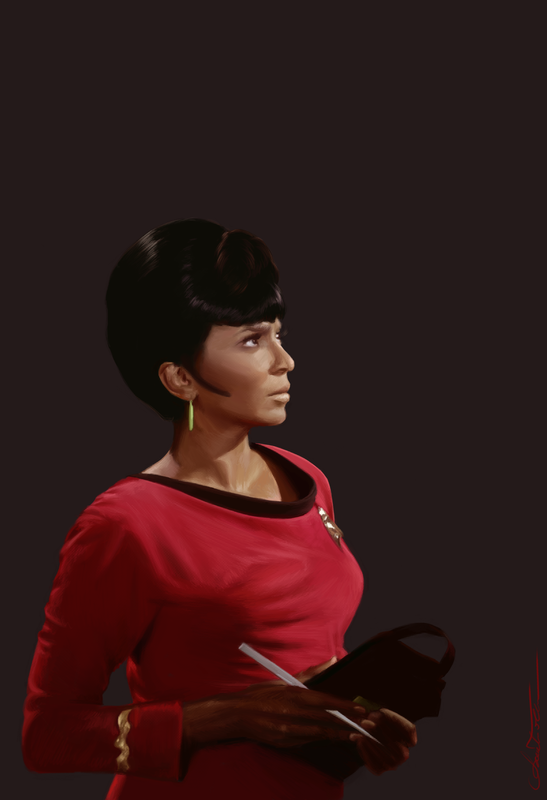 Those paintings of Spock and Uhura are fantastic! I am dumbstruck! ALWAYS WITH THE AWESOME ART! My walls have great jealousy. You find the most amazing art. I love the supernatural ones!! I've been rewatching Supernatural too. So great! I got a couple of friends hooked on it via Netflix... Bonus! Ooh! I love the Leia and Sherlock ones! I am in love with that Ariel print, it is amazing. I also admittedly squealed a bit at the cuteness of the first mario print. BAhaha! I crossed the streams! Bad Jen, baaaad! All very gorgeous prints! It's hard to choose a favorite! So many great pieces as always!!! commenting to enter, these are gorgeous! 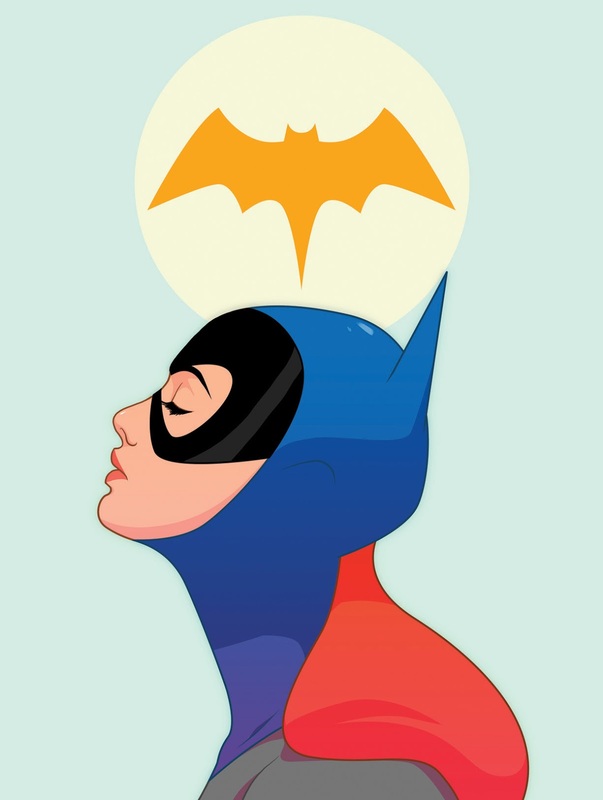 Love love love the minimalist batgirl. Thank you for introducing us to such lovely art and talented artists! I would love the Leia print for my daughters room! SUPERNATURAL! EEE! 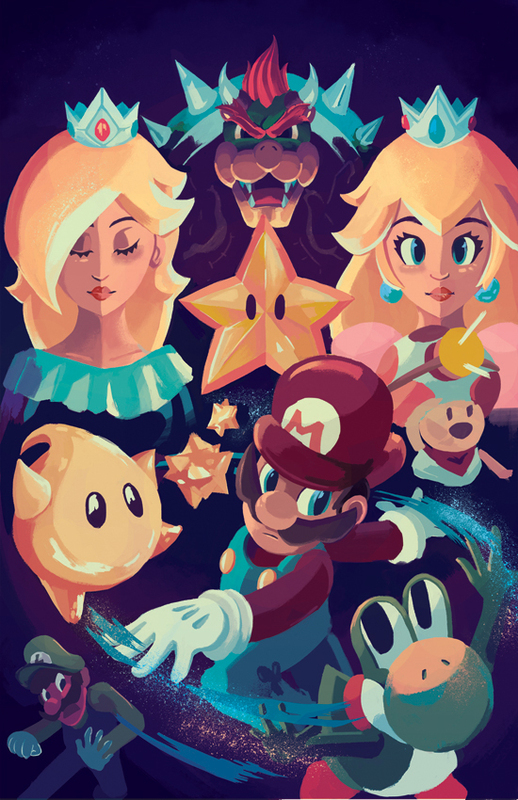 I love the Batgirl and Mario prints as well...this month it's so hard to choose my favorite. Ahhhhhh! I love the Sherlock and Beauty and the Beast is my FAVE! Wow! I would love to get some cool prints for my kids' rooms. Wow, that Sherlock piece is outstanding! Love the Little Mermaid one as well! You always find the BEST things!!! I love the Beauty and the Best art. So perfect and it's my favorite movie! I love art roundup days! Good roundup this month. 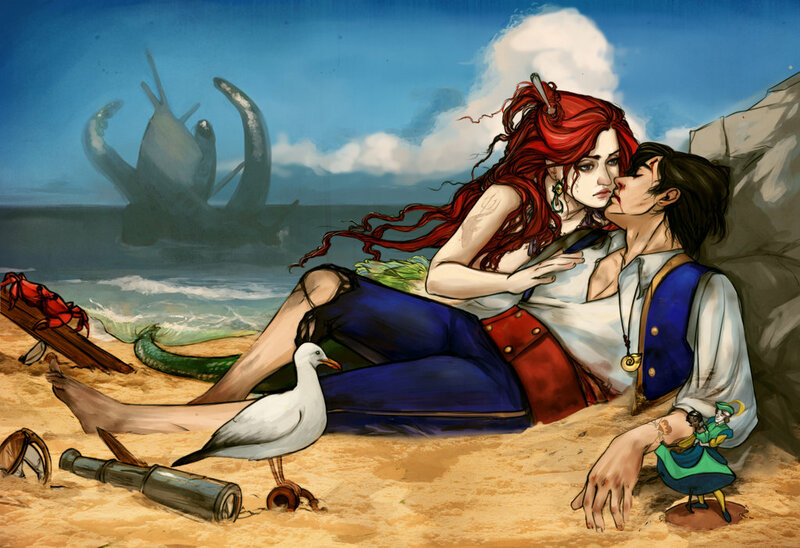 Love that Little Mermaid one. I totally need some super cool nerd art for my new office! I always feel my inner geek squeal like a little girl every time I see an art roundup post! so much awesomeness! I just purchases a couple beautiful prints for a friends birthday from deviantart.Wasn't impressed with the service of their print department, and since I know that the artists only get a very small fraction of the price, form now on I'll just contact the artist personally and see about buying directly from them. this stuff is fantastic! I have plans to one day go to a Con....thats the master plan. These art roundups are amazing. thanks! 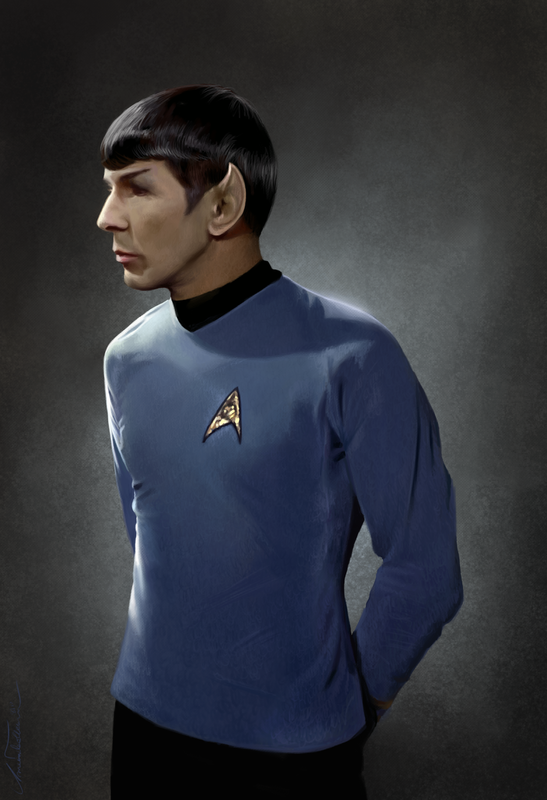 The Spock and Uhura paintings are incredible! 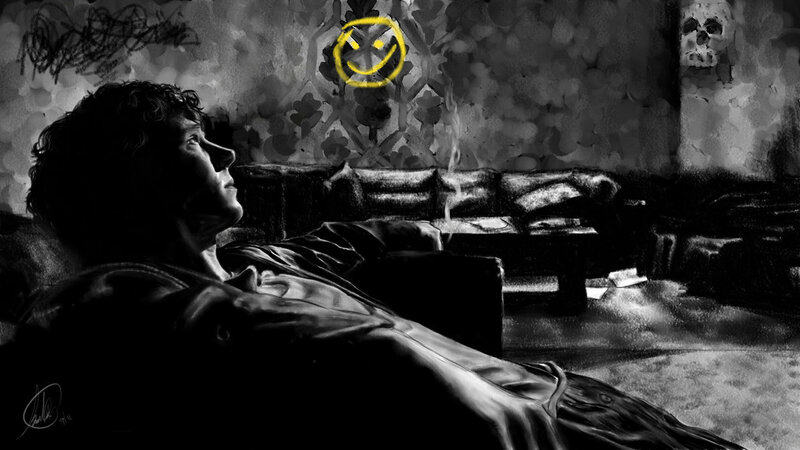 OMG that sherlock print is ridiculously amazing. Sherlock is incredible! Thank you so much for sharing every month, this is a highlight I look forward too! You always find the most brilliant art! Sometimes I am glad I can never make it to cons, I'd be broke in a heartbeat! Wow, so much awesome art. Oh Jen! You've struck gold this month, I don't think there was one piece there I didn't love. That Sherlock is gorgeous and the Beauty and the Beast gave me shivers, I've never had that before with a piece, I could stare at it all day. LOVE the Ariel & Eric one!!! Love me some geeky art -- as much as I'll hate missing the majority of DragonCon this year (7 months pregnant and a two year old in tow will prevent me from enjoying both the crowds and panels), I'll definitely be swinging by for a couple of hours to peruse the art tables. Pardon me while I swoon at the Sherlock print. That has to be the cutest Mario I've ever seen. Also love the Disney art. Beauty and the Beast has always been a favorite of mine. If I win, I seriously don"t know which I'd choose; that's an awesome problem to have. Oh. My. GOODNESS!! SOOOoooooooo many goodies. I really hope I get picked, I wish I could have some many of these lovely, lovely pieces! love the pieces you find. I am constantly amazed at the talent so many people have. So many beautiful prints. Tolleson's work is amazing! And I love Newsha's Beauty & the Beast - so much to look at! Man, I have got to finish my living room already so I can start finding art for it! The Amanda Tolleson pieces are so lovely! So much awesomeness all in one place! As always, I love all this geeky art!!! love them all but Maleficent is my favorite! You always have such a good eye! I'm obsessing over the Sherlock one! You have some real stunners here! I love them! That Sherlock print is absolutely stunning! Amazing. The Star Trek, the Sherlock, the Disney!!!! I'm adoring the Sherlock print and the Disney ones! It's bc of you that I've started collecting art at the con's we go to. Wanty! Such lovely stuff. You're so good to us. Pick me, pick me!!! These are SO gorgeous! I finally convinced my boyfriend to watch Supernatural and now he's hooked and will get sad if I watch an episode without him! Haha! Such great finds! I really like the Sherlock piece! Those Spock and Uhuru paintings are STUNNING. Wow, love the little mermaid and beauty and the beast prints! Love the art roundup posts. You always find such lovely things! That beauty and the beast one is just stunning! Wow! This batch was especially phenomenal. Cool stuff. Love these posts. Geeky art FTW! You find such amazing artwork. Thank you for sharing! Amazing! You always find such wonderful artword. OMG ... I totally want all of these!!! 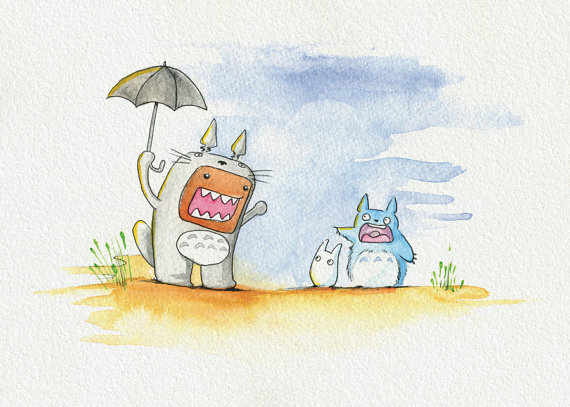 OMG love that cute Totoro! There are some amazing pieces in here. Love the Beauty and the Beast one and the Spock painting is amazing. Those Disney-inspired prints are amazing! Belle was always my favorite Disney princess. I love these posts so much! Even if I never win the giveaway, I love being introduced to all these artists! Good grief, I couldn't choose, Jen!! But I would find a way....especially since I turn 40 next week! Yikes. Disney! Supernatural! Sherlock! Star Wars! It is like a smorgasbord of all my favorite things! So many good ones! But ugh... That Sherlock print. I need it. The art roundup is always so awesome. Love it all! The R2/Leia one and the Sherlock one are both AMAZING! Because of you, when I went to my first con, I immediately went to Artist's Alley and looked around. Spent more money there than at any other booths! Would love to win some more amazing art! Wow! You always find such awesome stuff! So much gorgeous art! God help me if I ever actually make it to a Con someday -- I'll need a wheelbarrow just to cart my spoils around in! I am moving soon, And Would love to add one of those giveaway pieces on the wall of my new place. OMG Sherlock...I just need it so bad!! I really enjoy your art shows (not sure what else to call them). Thanks for sharing them with us. I would love to win this month! So many great pieces! Oh my gosh, I LOVE the Sherlock print! You pintrest board is always fun to look at. The Princess Bride Iocane print is too clever! I love all of your finds. I wish I lived in an area more accessible to cons. Oh boy, love that Mermaid one especially, thanks so much for the chance! 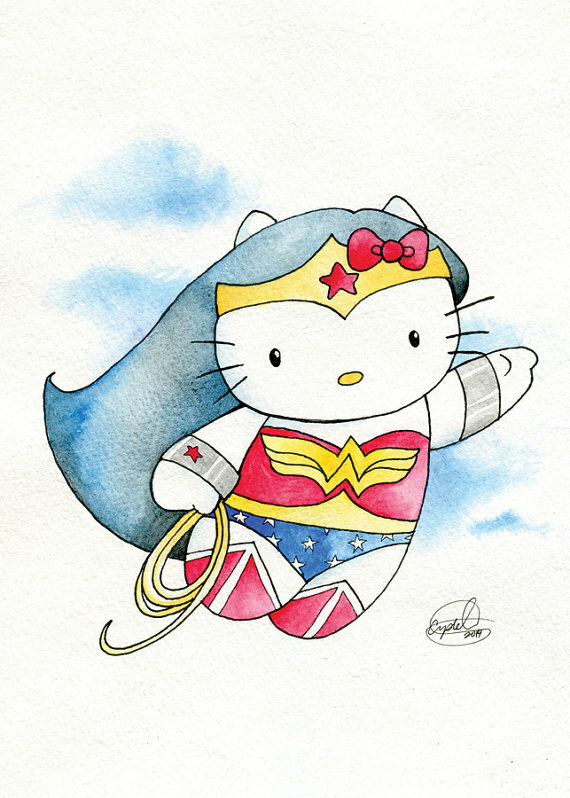 Hello Kitty Wonderwoman!!!!! My daughter would love it. Oh I'd love to get that Leia for my friend (she was the Beach Leia cosplayer you featured last year)! My jaw dropped at the Star Trek and Sherlock art. WOW. That is all. The Amanda Tolleson paintings were AMAZING. The expression on Uhrua's face is fantastic. As always, a very lovely art post. And great news about another reno at your house. I love when you have projects you share. I'm especially jealous of the wood work the two of you do because I feel that I could do quite a bit of that kind of thing if I had the tools! Hmm. Might need to rethink this! Oh, wait, I wasn't trying to suggest that I don't like all of your arts and crafts and cosplay and photos and book reviews and whatnot - I love those too. Clearly my brain has shut down already on this Friday. Wow, that Leia and R2 piece is gorgeous! The Ariel and Eric one is FANTASTIC.. but I'm really digging the Leia and R2 for some reason! You have such freaking good taste. I love it all! So pretty! Oh my gosh! The stuff by Amanda Tolleson is so amazing! And I love the Little Mermaid one!! The Beauty and the Beast one is probably my favorite. Belle is definitely my favorite Disney princess. Love those Amanda Tolleson paintings. It is so lifelike!! Oooo, pick me! Then I'll have to decide whether I'd rather indulge myself or watch my friend's jaw drop over the Sherlock piece!!! I comment every month hoping to be among the lucky winners! Keeping my fingers crossed! There's never a month that you post the art roundup that I don't see someone that I have to follow up with. Fantastic artists. Love them all! Thanks for the opportunity! Love those disney prints! Wow! So much detail! Maleficent! I like the other Disney ones, too. But Maleficent... 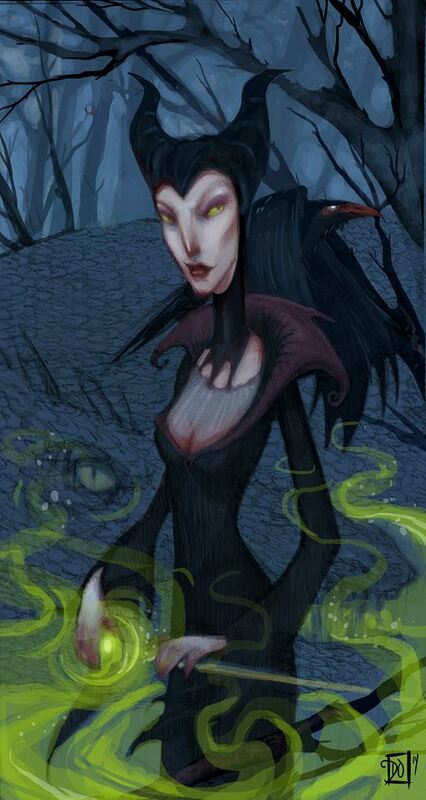 There is only one Maleficent! You've convinced me I need to spend more time browsing the art at our next con! So amazing! As usual! Oh wow! Amazing art picks! 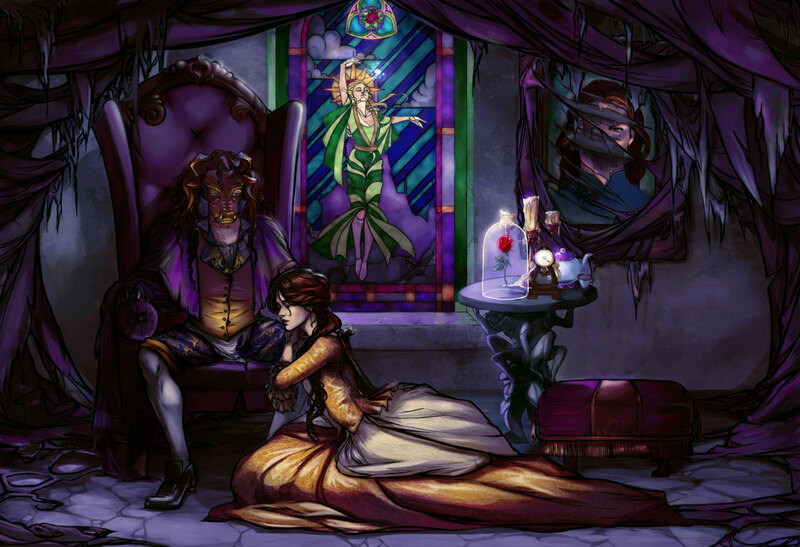 The Beauty & the Beast print is amazing! After watching all of Supernatural... twice... I am trying to figure out how to convince my own personal Moose (nicknamed prior to watching Supernatural) to watch it with me this time around. Beautiful art, thanks for sharing! Your art finds make me want to browse Etsy for fun art prints. Im gonna need a bigger house. Or more walls. Whew, I'm glad you clarified I could get that Sherlock print via email. I need it! I just moved to HI and neeeeeeeed new art for my so very white boring walls!! The Star Trek paintings make me want to cry in a corner cursing the fact that I can't paint-- they're amazing! I also love the Leia and Ariel prints! I'm trying to geek up my workspace - the one tiny corner of the house that isn't dedicated to my son/family. Please pick meeee!!! Art is the one way I can put a little bit of fun in my dorm room. I love it! You and I have such similar tastes in art that I have a love/hate relationship with these posts. I love finding new artists, but hate that I don't have enough money for everything! Wish I could see the Disney prints in person! They are gorgeous! That Leia and R2D2 piece is fab! So much awesome!!! I've only just started watching Supernatural (from the beginning) so I don't understand the references yet, but I will! Lovely, lovely art! Have fun in the man cave! I'm slowly redoing my kitchen with a makeover instead of a complete reno. The Domo-kun in the Totoro suit is so cute! I really love the Sherlock portrait too! Great art as always! Wow, you really found some awesomeness this time around! Love the Spock and Uhura, and the Sherlock is just delicious! I love these! especially leia and the wonder kitty! 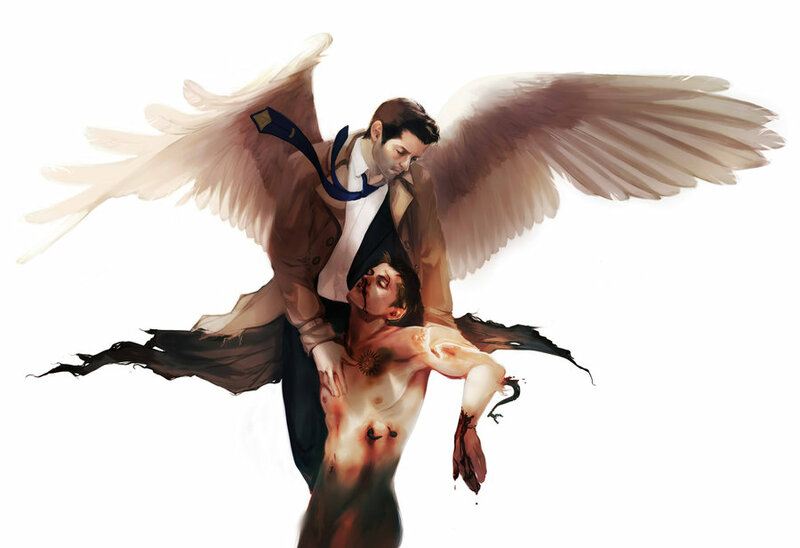 Those Castiel pieces are incredible! I would love to have that. i LOVE the beauty and the beast one!!!! Ooh! Me! Me! PICK MEEEEE! Think my comment got eaten. But yeah, I love that Sherlock so I had to post. I would love the Leia and R2D2 print! Thank you for showcasing all these amazing artists. I recently bought 2 Mike Maihack prints for my daughter (cowshell.com) based on seeing his work here on your blog. Sherlock is beautiful, and Wonder Kitty is too cute for words. As usual, the art is AMAZING. I love the Leia & R2D2 print. And those paintings, WOW! I love all of the disney stuff from this round of art. The beauty and the beast is one of my favourites. The first thing I'm going to do when I finish nursing school is buy all of the art. Well, and pay my student loans, but you know. Not sure if my phone just hates my previous comment to the point of just tossing it but whatevs. 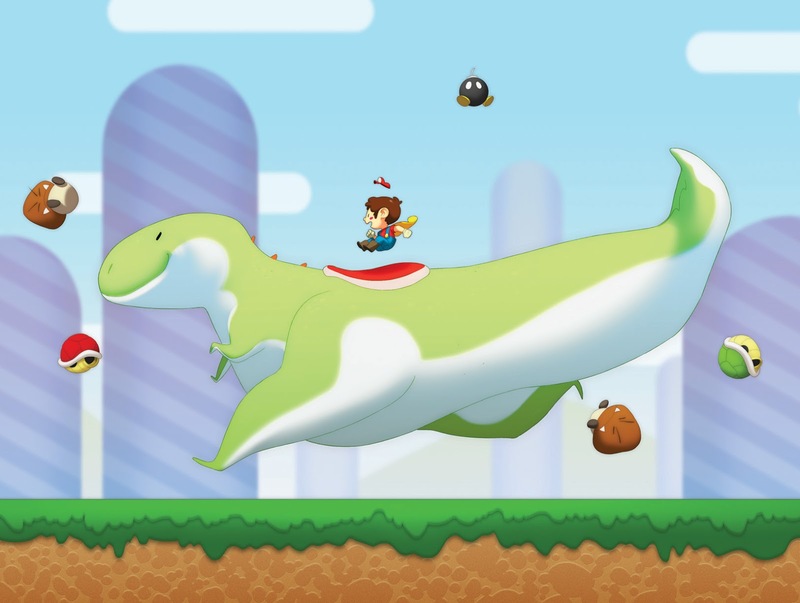 The one that I may have to get if I can scrounge up the money is the supersized Yoshi (makes me want an actual Yoshi now, even if I do just go around causing mayhem and destruction :D). Jen, You always find the coolest art - I love everything! Thanks for sharing. You always find and share the best art. Thanks! !